Harley-Davidson® gear, boots, apparel, and clothing for sale in San Jose, California. Looking for that extra something to complete your ride? Come in and check out our selection of Harley-Davidson MotorClothes®. 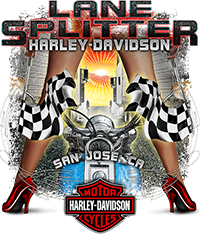 Lane Splitter Harley-Davidson® is a dealership in San Jose, California. We offer a wide selection of new and used motorcycles for sale in the San Jose serving the Bay Area. We offer financing, a full parts & service department and motor clothes. Visit Lane Splitter Harley-Davidson for all of your new or used motorcycle service needs for your Sportster®, Dyna®, Softail®, Touring or Trike. 408.998.1464 1551 Parkmoor Ave San Jose, CA.